Happy 2012, dear readers! Let's start this new year off with a clean slate, shall we? I like to begin the new year with a spring cleaning, and I suspect many of you do too. However, typical cleaning products are ripe with fragrance, preservatives, and create chemical fumes not worthy of a clean house. Even if you forgo the Mr. Clean and Windex, brands calling themselves "green" can be guilty of dirtying your house too. This is because cleaning products do not fall under the same category as personal care products, and therefore the FDA does not have standards for the ingredients listing. That's right. You're in the dark. Check your laundry detergent and stain remover; you'll see very vague, handwavey terms like "non-ionic surfactant." There are a lot of different surfactants out there, and this label is much too mysterious to trust. Luckily for you, clean cleaning products are probably sitting in your pantry right now. All you need for your new cleaning arsenal are: lemons, white vinegar, baking soda and soap. Yep, that's it. Told you it was easy. And cheap. Mix 1/2 cup vinegar and 1/4 cup baking soda into 2 liters of water. Use, and then store the leftovers to keep handy. It won't go bad, it's the cheapest cleaner you'll ever find and it works. Use it for pretty much everything. But if you want specifics, read on. Buy or reuse an old spray bottle and mix equal parts white vinegar and water in it. Spray the solution directly on the stain, let it sit for several minutes, and then clean with a brush and warm soapy water. This is the easiest one. 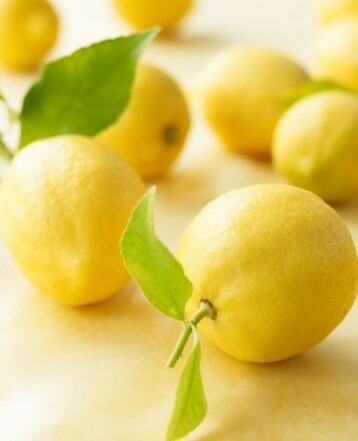 To disinfect a cutting board, rub a slice of lemon across the surface. For stains, squeeze lemon juice onto the spot and let it sit for at least 10 minutes, then wipe it off. Voilà! Most ink spots, pencil and crayon marks can be removed from painted surfaces using baking soda and a damp sponge. Rub the spot gently, then merely wipe off and rinse. For burned food stains on the sides of pots and pans, soak or boil a solution of 2 tablespoons baking soda for each quart of water in each pan. Let the pot soak until the burned particles are loosened, then wash as usual. If the particles are particularly stubborn, use an abrasive scrubbing tool. For the top of your stove and other surfaces that should not be scratched, simply use baking soda. Apply baking soda directly with a damp sponge. This recipe is also great for those stubborn labels on jars. Amply apply vinegar with a sponge to the sticker, and wait 15 minutes, then simply rub them off. Mix together ¼ cup baking soda and 1 cup vinegar, pour the solution into your toilet bowl and let it sit for 5 minutes. Follow up by scrubbing with brush and then rinse. This is the same mixture we used for scouring powder and marks on painted surfaces (ah, the simplicity of effective ingredients). Apply baking soda with a damp sponge and then rinse with water. Simply use the All-Purpose Cleaner applied with newspaper applied to cool window panes for clean, streak-free windows. Don't increase the concentration of vinegar, however, because this can damage the glass. That about covers it, floor to ceiling. Now you get to enjoy your beautifully clean house. Hi, from the long-ago (middle school) past! Found your blog through Natasha and am loving it. This post hit home, literally, because I use vinegar and baking soda for EVERYTHING! One of my favorite tricks for burnt-on food in pans is to let them cool completely - do NOT soak in water - then spray with vinegar/water solution. Or just straight vinegar. The burnt residue melts off. Seriously! I am trying out the soap & vinegar hair treatment, my hair is definitely soft! Thanks for the clean tips, can't wait to keep learning more! Cheers. Wow, blast from the past! Thanks so much for the vinegar tip. I'm definitely going to try that on my pots next. I absolutely love vinegar, it's so versatile.